Jon Young: "My life's work is connecting people deeply to nature, each other and themselves. Through over 35 years of mentoring, I've seen that deep nature connection changes us on a profound level. It rewires us and enables us to make much more of our human potential." Childlike happiness, vitality, deep listening and being truly heard, empathy, unconditional helpfulness, gratitude for life, compassion and forgiveness, inner peace and tranquility — we feel and embody these attributes when we are at our best. We strive to experience these qualities in our own lives and we want them for the people we love. We all have moments when others help us embody these characteristics and we help others do the same. We all have a deep desire and an unconscious competence to bring out the best in ourselves and those around us. This longing points to our connective potential, often lying dormant and waiting to be activated, given the right conditions and environment. Our intention with the 512 Project is to offer you an inspiring and effective template to create these conditions for yourself and your community. The stories Jon tells hold the keys to unlock doors within us - to remember what we already have inside that can enhance relationships with ourselves, one another and the world around us. Jon Young has spent decades distilling the practices that help us create this supportive environment, practices that activate our brain and nervous system for deep connection, and teach us to embrace and empower the best in ourselves and others. In 36 years of dedicated field work and research, in collaboration with countless mentors and elders from around the world, Jon has produced a map of 64 simple and highly effective practices that create this space. These universal cultural archetypes are practiced by traditional cultures across the globe. Each cultural element is practiced on at least three continents. We aren't teaching culturally specific traditions. We are laying a framework, a universal map of the types of tools that create healthy, thriving and connected culture. In this project, we will tell the story of every point on this map: 64 20-minute stories, each holding a picture of the parts we can play to create a world that embraces connection to ourselves, each other, and nature. We are creating audio downloads and videos that are easy to listen to in your car or watch on your computer, tv, or smartphone. These short stories will inform the way you interact with the world around you in simple and profound ways. Collectively, these ancient tools will give you a proven map for healthy, meaningful relationships, group unity, resilience and true connection, within the modern context of your life. Use them to effectively empower your community leadership, business team building, nature regeneration work, and a thriving family environment. By backing this project now, you will get early access to the material at a discount, and help us bring these stories to the world! We have already filmed the first 32 stories, in four weekends at four different 8 Shields affiliate communities (that contribute a dynamic vibrancy to the recordings). We need your help to fund four more weekend events and to cover post-production costs to bring these stories to life as video and audio. How do I use these stories? Education, Entertainment, Reference, or Guide. If you enjoy hearing a good story from time to time you will be happy to share your morning coffee or evening commute listening to Jon take you on a journey to different landscapes and experiences. Crackling fires and footprints in the snow. Bedtime stories of lions, tigers, and bears. Childhood adventures, playgrounds, backyards, and the wonders of discovery from those times and places. Perhaps you have been sitting with a particular challenge for a while and you are searching for a different way to approach it. Maybe one of these stories will help you discover that new angle. After all, they are stories about how humans have solved these problems before. Or perhaps you are already doing work in your community and you’re looking for new ideas and tools to try. Let these stories serve as a reference and guide to help you along the way. Measuring the world in extractable and exploitable components doesn’t make us happier or healthier. It doesn’t make our families love us more. The Western legacy wasn’t spread with a sales team. For everyone in the Western world there was a moment in history that forever changed our system of values. In all of our histories, our ancestors once lived in deep, reverential connection to the natural world, and were ultimately brutally forced into a system of exploitation and extraction. Whenever a culture is conquered in this game of imperialist dominoes, within a few generations the only thing the people of that culture know how to do to succeed in the world is consume, exploit, extract… and repeat. The Western legacy is born out of the moment when connection no longer matters. Don’t get us wrong. The modern experience is absolutely amazing! But what did we lose in the process of modernization? Can we let the cultural patterns of our ancestors inform our modern experience so that we can walk in this world in a more responsible, intentional way? We certainly think so. When our lives are influenced by these cultural elements, attributes of connection begin to emerge. And when we empower each other and ourselves in this way, we all do our part to make the world a little bit better. Each block of eight stories represents tools for a particular stage of life, and each block contains a story that reinforces each attribute of connection. 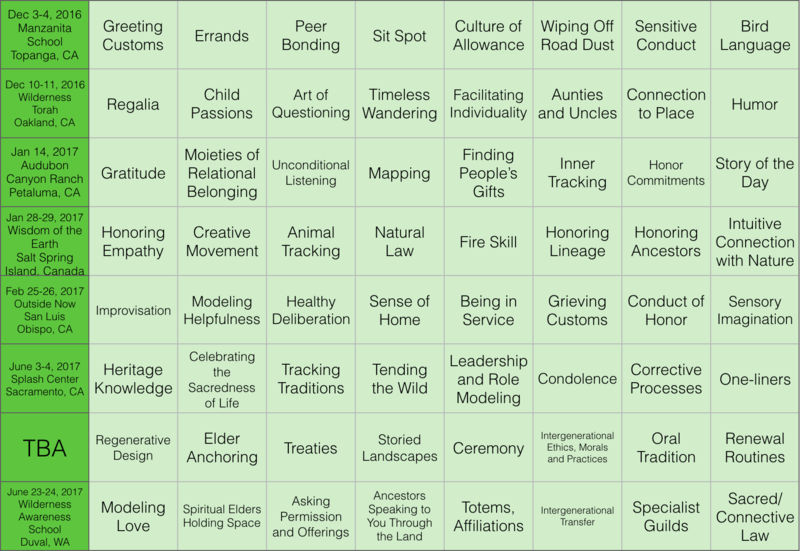 In its entirety, this map of 64 relatively simple archetypal cultural patterns lays the foundation for a fully connected culture, fully empowered people, and hope for a positive future. Goals & Where Do We Go From Here? This collection of stories are Jon’s life work, gathering the best practices in connection from human cultures around the world. Now we aim to gather these stories in one place so we can all enjoy and learn from them together. These 64 Cultural Elements stories are the first of 512 stories. Each of these stories point to practices, skills, and models that need to be studied and developed. You can think of them as 512 problems in need of a solution, each interconnected with the others. For some elements we have already developed strong best practices. For others there is still much work to be done. Our mission is not to try to solve each problem on our own. We need everyone’s help to do that. Our mission is to start the conversation. And you can help us find the best way to solve these problems. We plan to start a regular podcast and radio show where we share a different story every week and discuss that story together. We will seek out leaders from over 500 organizations and communities practicing this work and discuss their approaches, challenges and successes in implementing these principles in their communities. This work is being implemented in nature programs, schools, universities, businesses and therapeutic practices, as well as by individuals and families in their daily lives. These tools have many applications, from simple routines to complex curriculums that weave together dozens of elements, or an approach that works in a particular coaching, personal or community development model, and/or therapy. If we can collaborate to build a database and network of these best practices, we can multiply the power of our collective efforts in this movement and bring this work to people in many diverse communities and disciplines. We hope that these stories can serve as reference, education, and entertainment for those who are interested in this work and just beginning to understand how to apply it in their own lives. They will have these stories as their regular listening companions in cars, trains, coffee shops, and living rooms around the world. Village Video has run three successful Kickstarter projects in the past; Make your own Scandinavian Turnshoe, How to Build Rocket Mass Heaters, and Bird Language with Jon Young . We are excited to partner with Jon again to bring you these important and inspiring stories. Jon Young: “My life’s work is connecting people deeply to nature. Through over 25 years of mentoring, I’ve seen that deep nature connection changes us. It rewires us and enables us to make much more of our human potential. Aidan Young I have been a lifelong student of the 512 cultural elements and had the opportunity to mentor others in nature and music for the past 15 years. Now, I am excited and grateful for the chance to connect with all of you as the host of our upcoming podcast. We will experience and learn from these stories together and start a conversation about how to take this work to the next level. Ingrid, Nad'a, Hannes, Lisa, Donato, Elias, Nicole, Sal, Mandylee, Pete Bergen, Dr. Paul, Sabra, Zelig, Roberto, Manzanita School, Wilderness Torah, Wisdom of the Earth. See what we're up to and view our live streams!